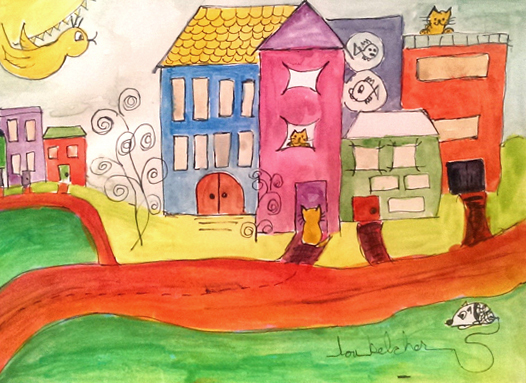 This KittyScape is called Welcome Home… That kitty in front of the purple door got curious and wandered away from home. It took him a couple of days to find his way back. All’s well…. He’s home…. This entry was posted in art and tagged 30 in 30, Day 13, Welcome Home. Bookmark the permalink. Love it and we like the addition of the little fishes. Have a super Saturday. That is a very colorful homecoming! WE love the BRIGHT colors in this one. Lovely painting… but I hope that never happens to me! We really like this one…the colors are so vibrant! We so glad the kitty found his way home.